If there was a “poster child” for businesses as good neighbors in Oregon, you would be hard pressed to find a better candidate than Dutch Bros. Coffee. Founded in Southern Oregon in 1992 by dairy farmer brothers Dane and Travis Boersma, Dutch Bros. Coffee is the country’s largest privately held, drive-thru coffee company. Like many small business success stories, Dutch Bros. started from humble beginnings as a single espresso pushcart in the southern Oregon town of Grants Pass. The company now has 265 locations in Oregon, California, Washington, Idaho, Nevada, Colorado and Arizona. The franchisee model can be a tricky one for maintaining consistency, be it in quality or in philosophy. Dutch Bros. seems to have found the perfect balance of maintaining a loose enough culture to encourage each franchisee to reflect its community while maintaining a strict commitment to quality. One measure of that is the consistent awards the company receives for quality. Dutch Bros. Coffee was ranked by J.D. Power and Associates as highest in customer satisfaction compared to other coffee companies in its 2012 and 2013 Specialty Coffee Retailer Satisfaction Report℠. For thousands of daily commuters, the Dutch Bros. Coffee stand is a lifeline destination for getting the day started right. 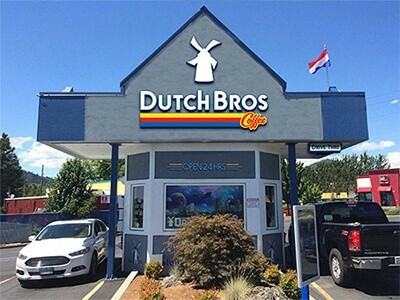 Behind the windmill logo and the distinctive blue color scheme of each location, the local Dutch Bros. outlet is also a lifeline for an ever-growing list of community causes and organizations each franchisee is encouraged to support. 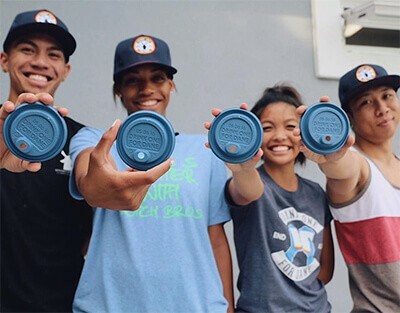 Dutch Bros. Coffee franchises are locally owned and operated, and owners are strongly supported in taking a personal investment in the communities they serve by contributing to various local causes and organizations. Visit the company website and scroll over to the “News” section. There you will see a virtual roadmap for how to be a good business neighbor. Story after story tells of local franchises contributing to local causes. One of the better known causes the company supports is its Drink One for Dane campaign. One day each year is dedicated to this event and the sale proceeds from all franchises for a single day are donated to the Muscular Dystrophy Association (MDA). MDA is the parent organization overseeing research into Amyotrophic Lateral Sclerosis (ALS), what is often referred to as Lou Gehrig’s disease. It’s a cause that hits close to home. Dane Boersma, co-founder of Dutch Bros. Coffee, lost his battle with ALS in 2009. This past year, Drink One for Dane fell on May 6. 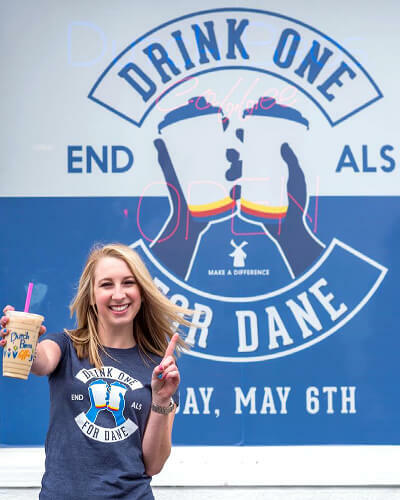 With an outpouring from all Dutch Bros. communities, the company set a record this year, collecting and donating $758,500 to MDA for ALS research. This year marked the 10th anniversary of the event and in that time, Dutch Bros. has collected $2.53 million for MDA. As the philanthropic efforts of Dutch Bros. has grown over its lifetime, a decision was made in mid-2013 to coordinate, focus and even expand the company’s reach in that area. Dutch Bros. formed the Love Abounds Foundation. The Foundation originally had a four-pronged focus: Health, Music, Youth, and Origins. When Travis Boersma took part in the CBS show “Undercover Boss” and saw firsthand how the coffee they relied on was grown and harvested, it was clear that Origins as a focus and supporting those growing coffee is very important. Since its inception, the Foundation has raised and distributed more than $1 million in proceeds to charitable organizations. The spirit of support and cooperation at Dutch Bros. extends to the partners they choose to do business with. It’s one reason why they have been supporters and participants in the SAIF OBI CompSAFE program. It’s a source of pride at Dutch Bros. that the public face of giving is equally reflected in how they treat employees. Perhaps the best summation of the Dutch Bros. philosophy comes from its leader and co-founder, Travis Boersma.